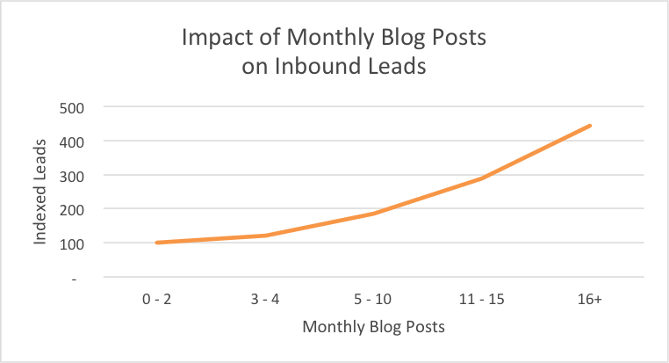 Running a company blog is a powerful form of inbound marketing – when businesses provide customers with the resources and information they need to make a decision instead of plying them with ads, calls, and emails. So, let’s go with order. Don’t fall into the trap of writing about topics that interest you, people from your company or your business sector – write about stuff that matters to your customers. All this will determine the topics, style, tone, and formatting of your blog content. 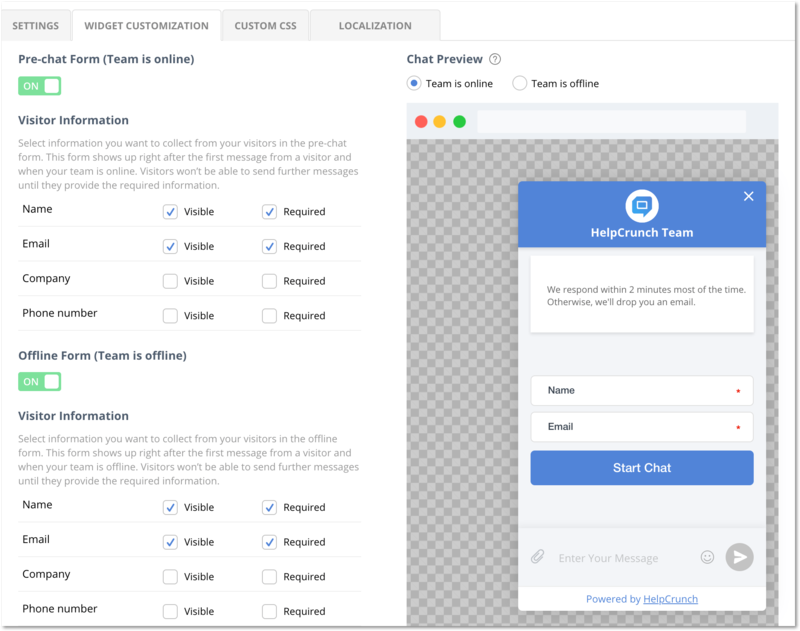 For example, as a live chat software provider, we at HelpCrunch have this B2B blog directed to all online and offline business worldwide that need to communicate with customers online for support and sales purposes: SaaS companies, e-commerce site owners, bloggers, and other businesses with an online presence. Product news (updates, new features, improvements, plans for the future etc). These should be always introduced from the customer’s perspective – focus on the benefits your new features can deliver to customers. Such posts shouldn’t take up more than 30% of your overall content. Company news (participation at conferences, awards, anniversaries, events, people in your team) must contribute to building your company’s reputation and credibility. Trending topics in your industry. Research what’s hot in your industry – this is likely to be interesting for your customers. Browse your competitors’ blogs and check which of their posts performed well. Go to Google Trends, Google News, Buzzsumo and quality magazines in your industry to see what’s been trending recently. For example, we monitor what Forbes, Entrepreneur, CustomerThink, Smashing Magazine, Business2Community have to say about customer success and sales. Blog posts that provide value and resolve customer pain points – this is an extremely important content category that wins your customers’ trust by giving them the answers that they’re looking for – and eventually converts them. What common problems and challenges are your customers frequently faced with? What might be their business goals and ambitions? What are their areas of interests, fears, risks? In your blog post, don’t wander around and present mere information. You should provide a framework for solving a problem. Also, don’t dive too far into the areas of business that you don’t cover. The information you give needs at least to some extent be related to the products or services you provide. To convert readers into paying customers with content, you must understand why people decide to buy a product. how you guarantee that you’ll live up to your promises and won’t rip them off. That’s why blog content created for conversion tends to be long-form – it gives you more time to engage readers, earn their trust, and demonstrate that you have the product or service that meets their needs. 3. Why should I buy it NOW? Building a sense of urgency is the trickiest task. Illustrate why it is imperative to deal with the problem as soon as possible. building an effective online store. Yes, the overall goal of the blog is to sell. But does this mean that every single blog post should be aimed at immediately turning a reader into a customer? Not necessarily. It can be a brick in the foundation of trust between you and them and contribute to winning the customer in the long term. Trust is the second step in the buying process described earlier and it’s earned gradually. Anyway, avoid hard sell in your copy. An ideal sales text should be largely based upon advice and selling should be only its natural outcome. Providing value is crucial but don’t give away everything. After reading your post, customers should be happy they’ve gained useful information but should want to learn more or get further assistance by completing a certain action, like subscribing to your blog newsletter, downloading a demo, signing up for a free trial, or buying your product. If you want to grow your blog audience, you need to post on a consistent basis and maintain fresh content. That’s why once you’ve got the hang of writing on a regular basis, start timing your blog posts. 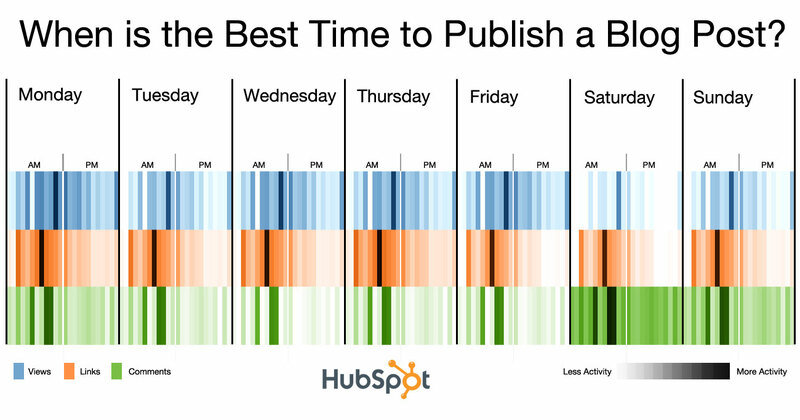 As for the day when a day to publish a blog post, Hubspot analyzed 170,000 blogs and found out that Mondays and Thursdays are the best days for publishing. That’s all for now on planning your content. Let’s move to the second part of our blog post. It’s time to start writing your draft, right? Nope! First, you need to give a structure to your ideas and create an outline. Planning is a vital step to avoid scattered content that leads to nowhere. Jot down your points and ideas and then place them in a logical flow. This will make creating your first draft times faster and easier. Make your blog easy to consume. Don’t be simplistic but don’t overload the text with jargon. If you run a B2B blog and write for a specific audience, you may use technical or business terms if you’re sure that your typical customer understands them. The current trend is to adopt a conversational, informal style. This immediately transfers you on friendly terms with the reader. Don’t use archaic, literary or rare words because business-oriented people will lose interest. Avoid impersonal tone. Who wants to read a third-person, robotic, emotionless article? Write like a human, use the first person from time to time, include examples from your or your team’s experience, tell your own stories. Use the word “you”. This way, you make your readers feel like it’s just you and them as if you were sitting down having a chat over a cup of coffee. Create a conversation with your readers by asking questions throughout your post. Invite them to think about and respond to what you are saying. Encourage to share thoughts and opinions in comments – it will help you gain higher engagement. 1. Focus on benefits your target customer can get from reading your copy. What business value does your article provide to the audience? Does it sound like an advertising piece or like an expert piece? Is your post purely theoretical or practically applicable? 2. Write longer detailed texts. Thoroughly answer the question. Superficial, generic content will be ditched at the beginning – people don’t have interest in obvious things. Dive deeper, explore the topic but avoid fluff at the same time. Consider writing an ultimate guide. I’d recommend, though, not to give away everything, though – the readers should always be willing for more. As you’ve probably noticed, we’ve been creating an ultimate guide on content marketing and we’ve broken this big topic up into several pieces so readers gain valuable tips post after post. It’s good to organize your content in the form of step-by-step instructions, checklists and how-to posts – people like texts that teach them something. 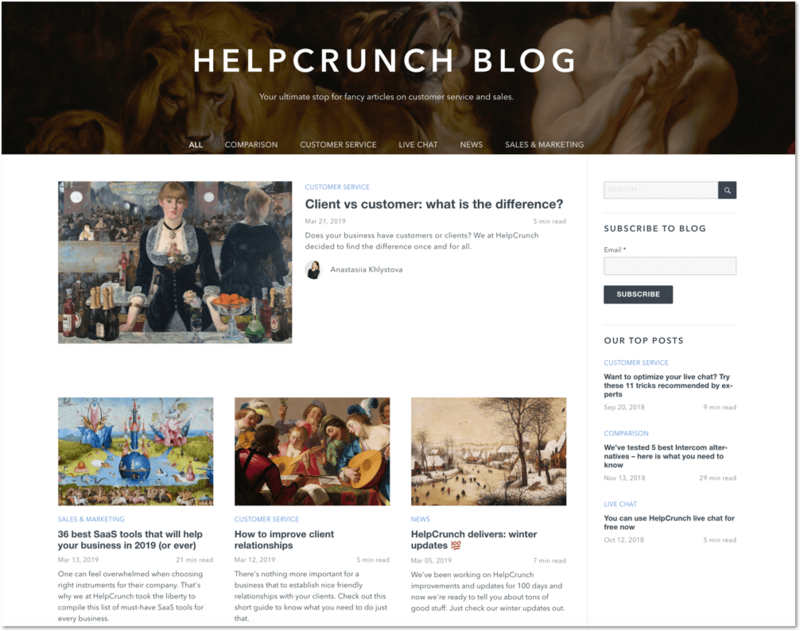 That’s how we usually approach content at HelpCrunch – we publish a lot of how-to articles on startups, customer engagement, customer service, retention and online sales on our blog. 4. Hook your readers with a compelling headline. Providing numbers and stats in your headline is also a great way to hook readers. Another good strategy is to use power words. Wordplay also helps catch the eye of the reader. If you need some inspiration, you can find a lot of handy headline formulas here. 5. Write a killer lead. If readers don’t get past the first sentence or two, you can be sure they won’t convert. In your lead, you can provide important information, eye-opening statistics or a striking fact, or ask direct questions that resonate with the reader. Avoid generic stuff like: “It’s widely known fast and effective customer support is very important for business success”. Better make it like this: Wanna boost your blog or website conversion by 20% at almost no cost? 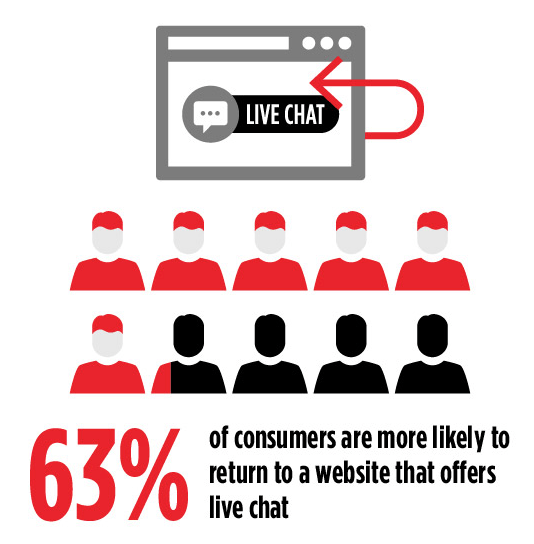 The AMA study confirms the effect of offering live help on your site. Tip. You can first write the body of your post and the introduction when it’s finished. You’ll have clear ideas for a better and will not have to rework it. Modern customers have shorter attention spans so many of them will just skim through content. Make it possible for a skimmer to get the message. Subheadings. Break up your content into easy-to-manage sections and use subheadings. Bold them with H2 or H3 html tags. This will also reinforce your SEO ranking. To keep reader focus, paragraphs should be short. The general tip is not to include more than 3-4 sentences. Write in shorter sentences and use clear structures. The ideal sentence length should not exceed 20 words. Longer sentences are also ok, but don’t exaggerate with them. Use numbers to break up the block of words. Use plenty of bullet points and numbered lists. This will make your text easy to grab. Apply boldface to phrases or words to which you want to draw the attention of the reader. Use capitalizing with moderation – it may be pretty annoying. Choose a font and size that’s clearly legible. Insert images to break up the text and illustrate your key points. The human brain processes visuals a lot faster than textual content. Adding captivating images or screenshot will certainly boost readability and engagement. You can use this resource to check your readability score. Which blog are you going to return to? I guess the one that is data-driven and trustworthy, true? To build credibility, weave outside sources and proof into your post. Include infographics, charts, graphs. Marketing studies have shown that infographics are more often shared and easily understood than other forms of media, and greatly boost conversion. Fill your post with quantifiable statistics. Cite research and survey findings from well-established and reputable organizations that use exact statistics and numerical values, rather than providing generalizations or vague claims. Provide case studies. Case studies are 3rd most influencing content type in the B2B purchasing process. According to Content Marketing Institute, 75% of B2B marketers consider them a high-converting marketing strategy. People see that your solution works for others and that instills confidence that it’ll work for them too. Deliver social proof. Did you know that written testimonials increase conversions by 25%? More people will use your offer after they see that others are doing the same with success. Other forms of social proof include logos showcasing important clients that you’ve collaborated with, number of customers, subscribers, and social media followers. Okay, now your readers are immersed in your article and nothing gonna distract them from reading it until the end. But you don’t need only your faithful readers – you need paying customers. In the next part, we’ll explore how to make your content work and actually convert your audience. Opinion makers can recommend products to their followers and help increase sales. Do your research and find influencers who have a similar audience to yours. Get them notice you by linking to them in your article, mentioning them at your posts, thanking for valuable content, commenting on their posts, publishing their content review or including them in your best content weekly/monthly round-ups, etc. Then write a great article, email it to them and ask for feedback. If they truly like it, they may decide to share it on their social pages and even include in their newsletter. Tip. Put a lot of effort into your content, ‘cause influencers will unlikely publish beginner staff – take your time to write a killer article. When your content starts getting really popular, include the number of social shares for each post on your blog to emphasize how popular it is. Team up with other companies who are not your competitors but whose products, services, or content are related to yours – and exchange your blog posts. You may agree to introduce some adjustments to the ready- to make it more suitable for the other blog’s audience or you may opt for writing an article from the ground. Cross-sharing lets you expand your audience immediately without any additional effort and investment. Has it ever happened that you bought something on sale because the price was good and it was the last item available? I think it actually happened to all of us. The “fear of missing out” (FOMO) is an effective sales tool. Apply the language that produces feelings of immediacy, accelerate the reading speed making content your text more dynamic. Begin the post normally but as you get closer to the end, use shorter paragraphs and sentences. This makes us read faster. And boosts urgency. Deliver evidence or statistics why it’s important to buy your stuff now. Let’s say you offer a product that helps SaaS businesses reduce churn. Use figures and research to demonstrate how many clients and how much money they could lose in a day, or a week or month etc if they don’t start using your product. Live chat allows turning a passive reading activity into an active interaction. You’ll be able to answer people’s questions, discuss your points of view, ask for their opinions, or even promote your product and services. The live chat gives you a chance to talk live just like you would do in WhatsApp or Viber in a friendly and engaging way. You will be also able to capture people’s contact data (emails!) via a pre-chat form that users may be required to fill in. Moreover, you can start talking to your readers first by firing proactive chat messages establishing a connection and converting them into active prospects. You can find a good live chat almost at no cost ($9/month). As you see, we use our own live chat on our blog page and you can try it for free for 14 days. We already mentioned the fear of missing out but you may also use excitement, high and low moods, suspense, anger, humor, anticipation – they increase engagement and the probability of conversion. Include your personal point of view, vary the tone and language, use power words, sparse your content with emojis and gifs where appropriate. We already mentioned time-limited offers calling for urgent action but you may also include non-time-sensitive discounts and deals . Adding these deals will also encourage customers to regularly check out on your posts and build loyalty. You can make your blog convert indirectly – through emails. Once you have the emails, you can create an email drip system and not only send them a newsletter but also product updates, special deals, time-limited offers etc. You can automate the process with services like MailChimp, Aweber, or HelpCrunch Email Automation and create a sequence of effective time-based or event-triggered email campaigns. Research shows that wisely composed personalized emails still convert better than social media. Offer regular high-quality, value-loaded content and encourage readers to subscribe to blog’s newsletter. You will collect a solid base of prospects. Analyze what they’ve read in order to learn which product or service they might be most interested in. Use a very actionable technique known as content upgrade. These are long-form guides that elaborate on the topic you discuss on your blog. Сontent upgrades are only available to download once a reader signs up to your email list. For example, you may offer an ebook, an ultimate guide, or participation in a free webinar. Tip. To make ebooks longer, some authors load them with fluff and the readers have to go through hundreds of pages to get just a couple of workable tips. Always prioritize business value over text volume when creating an e-book. Another tip. Don’t include long sign up forms – just an email field is enough. At most, you may ask for a name if you want to send highly personalized emails. Weave internal and external links throughout your content. If you mention your product and services, you give readers an opportunity to read about them on your website in detail without being intrusive and promotional. Also, cross-link to your other related blog-posts and include links to useful and relevant external resources. Tip. Make sure that the links will open in a new tab, otherwise, your readers will likely lose your article. Use links sparingly not to distract people too often. Many bloggers write great content and never ask their readers to do anything about it or have confusing CTAs. Give the reader something to act on and create a clear and compelling CTA banner, bar or button. Summing up, what could you ask for? Hope these tips will help you turn your blog into an effective marketing asset and drive conversions If you find the post interesting, feel free to share it on your FB, Twitter or LinkedIn or whatever social network you use. If you agree or disagree at some point, give us a shout through the live chat or leave a comment under the post. One can feel overwhelmed when choosing right instruments for their company. That's why we at HelpCrunch took the liberty to compile this list of must-have SaaS tools for every business. There's nothing more important for a business that to establish nice friendly relationships with your clients. Check out this short guide to know what you need to do just that. A really helpful article! As I’m starting my own blog, this info is a step-by-step instruction of what I need. Thanks!